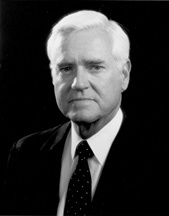 HOLLINGS, Ernest Frederick (Fritz), a Senator from South Carolina; born in Charleston, Charleston County, S.C., January 1, 1922; attended the public schools of Charleston; graduated, The Citadel 1942 and University of South Carolina Law School 1947; admitted to the bar in 1947 and commenced law practice in Charleston; served in the United States Army 1942-1945; elected to the South Carolina general assembly in 1948, 1950, and 1952; speaker pro tempore, South Carolina house of representatives; elected lieutenant governor of South Carolina 1954; elected governor of South Carolina 1958, serving from 1959 to 1963; presidential appointee to several federal commissions; elected in a special election on November 8, 1966, as a Democrat to the United States Senate to complete the unexpired term of Olin D. Johnston; reelected in 1968, 1974, 1980, 1986, 1992 and 1998 and served from November 9, 1966, to January 3, 2005; chair, Committee on the Budget (Ninety-sixth Congress), Committee on Commerce, Science and Transportation (One Hundredth through One Hundred Third Congresses; One Hundred Seventh Congress [January 3-20, 2001; June 6, 2001-January 3, 2003]); unsuccessful candidate for the Democratic nomination for President of the United States in 1984; was not a candidate for reelection to the Senate in 2004; was a resident of Isle of Palms, S.C., until his death on April 6, 2019. Hollings, Ernest F. Fritz, with Kirk Victor. Making Government Work. Columbia: University of South Carolina Press, 2008.